Found this on Weather Underground this morning. 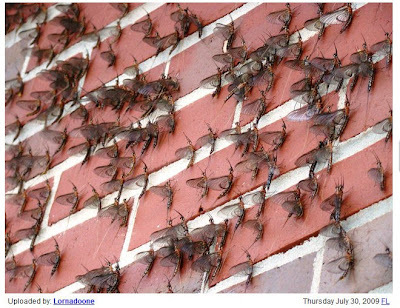 The caption has this mayfly invasion is from FL. I really like this photo because it reminds me of the Elk River Fly Shop during the Sulphur hatch during late April through mid-May. Can't wait to get back on the stream soon. With rain in the forecast for 8 of the next 10 days, the Steelhead will start running further up the streams. Reports have indicated that they are already in the mouths of the major streams as we speak. Hopefully during my bye week, I can get a early Steelhead trip in.